The idea that the world is confined with boarders and barriers is slowly evolving to an open space during this globalizing age, without for example passport controls on the ground in the EU. The utopian idea of the world and its surroundings mainly found in Science Fiction movies is gradually turning into a non-fiction world. Hovering trains, projected computer screens that interact with swiping and touching or printing out a car at home … these images were once portrayed as a wild idea and a great movie script but, they have now become the reality we find around us. Technology is incorporated in almost every aspect of our daily life and is therefore changing the way we look at our real environment. In fact, one can say that technology is extending and creating possibilities that before weren’t ‘physically’ possible. Augmented reality (AR) combines both the physical and virtual reality (VR) to create a so-called Mixed Reality (Milgram.1994: 282). Whereas VR focuses on the immersion of a participant in a synthetic virtual world, AR on the other hand combines both virtual into the real-world environment. This means that the way we perceive the world around us visually is covered with a new layer of technology making the possibilities of this innovative technique endless. Searching the web, different augmented reality forms can be found and ways in using it. When reading the ‘About page’ on different Augmented Reality websites, key words can repeatedly be found. In the word cloud above, a few of theses key words can be seen. 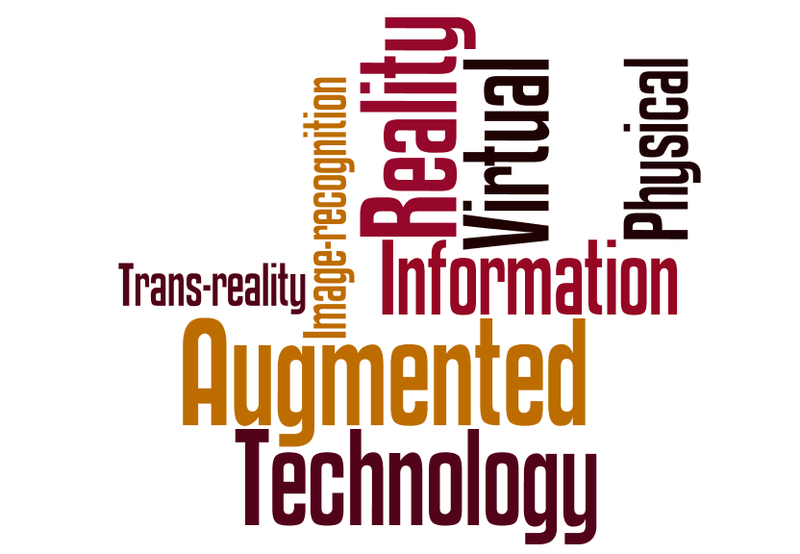 The articles that caught my attention could be categorized into different ‘hubs’ in which augmented reality is used for. My first encounter with augmented reality was the launch of Google Goggles in 2010. This enables the user of this app to scan objects with their phone (android or iOS) and receive data on the scanned object. For example if you want to know the translation of your French menu you can scan it and Google Goggles translates it. The idea that a phone recognizes the flat 2d image on the screen and provides you with the wanted information found by connecting the lines of the image and translating an image to data, is just fascinating. Augmented reality is now also being used in the medical field creating live interactive imaging to help assist medical students. For example, AR helps visualize brain surgeries by accompanying a better perspective of the brain. A normal procedure that includes a camera in a patients body (Minimally invasive surgery) is aided with AR images of the brain superimposed onto the patients head (Cameron, 2010). Using AR as an educational tool it can also be very useful to visualize bone structures to med students. Predictions of future educational systems have been made that include the usage of AR in a more standard way varying from elementary school to university. The book ‘On the horizan’ written by Arthur Harkins, gives a new perspective on how AR can change the educational systems. A quick preview of this book can be seen on the following video. Another interesting moment when I realized that augmented reality will have a significant impact on the world, was when I noticed how it was being used in advertisements and in the marketing sector. The old school way of promoting a product via a TV commercial, on the radio, in a magazine or as a banner on the web is almost always a ‘one-way’ interaction. A fellow student, Jorien De Wandeler, also wrote a small blog on this subject. AR provides the solution to an immersed marketing strategie that surrounds and interacts the user with the product. The boundaries of the physical world are eliminated when combining AR. For example the deoderant brand LYNX used AR to give the audience the illusion that angels were falling from the sky. This can be seen in the following video. The interaction that is evoked between the receiver and the sender is innovative and groundbreaking. Also Mini Cooper got in on the action to present the new model by using AR in a magazine that gave a 3D visualization of the car. Looking through a web cam the car jumps out of the magazine. The ‘making of video’ can be seen on the following link. Giving a business card to someone has now also become integrated with AR possibilities. The app Aurasma makes it possible to combine a video to an image. The explanation of Aurasma has also been presented in a TED reading but to give a short example it is possible to scan a business card of someone and having used Aurasma this 2D card is connected with a 3D video that pops up when scanning the business card. Again, it is comparible to the way in which Mini cooper used a 2D image and creates an interactive 3D image. Of course the usage of AG and game play is a way in which al fantasies may come true. Through projection and card usage such as the ones Nintendo use, a new dimension is given to game playing. The physical world is now layered with a virtual one without boundaries. Like advertisement the players in this situation are involved more into the game. The game ‘AR Invaders’ is an iPhone app that allows you to play the game in your direct visual environment. Say you’re on Times Square in New York city, point your camera to the buildings and that will be the setting of where the alien invaders will fly in on saucers. It would then ‘appear’ that they are in front of you and in the middle of Times Square. T-Shirts have now also changed into an interactive visualization. For example you can have an alien rip open your shirt and jump out or you can play rock paper scissors with your own shirt made by T-Post. Augmented reality can also be seen as a way of art and shaping the surroundings differently. Some interesting art forms have been done by the production of urbanscreen that projects images on buildings to give the urban scene another dimension such as this video.